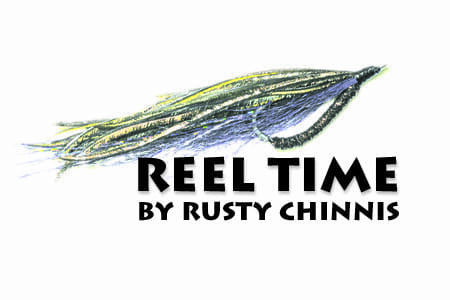 Fly fishermen and fishermen, in general, are always seeking ways to improve their enjoyment of the sport. And while that ultimately boils down to learning ways to be more successful at catching fish, it’s not really numbers that drive a fly fisher’s passion. It’s more personal than that. If it were a numbers game, we would still be fishing with live bait and waiting for the fish to find us. Our path to success is paved with mentors and milestones that redefine our personal passage through a life of fly-fishing. It’s experiencing and seeking to understand the natural world and the fish that swim its waters that makes the fly fishing journey so special. I first picked up a fly rod over 30 years ago, and over three decades I’ve had many memorable days on the water. When I look back, some of my fondest memories are not about the fish that I’ve caught but the people I’ve met along the way, the personalities I’ve encountered, and the friendships fostered. Fly fishers seem to possess a quality that attracts, entertains and enlightens us. No matter where you are in your evolution as a fly angler, I’m sure you’ve had or will have the same experiences. Over my years of fishing, one of the most charismatic individuals I’ve encountered in my time fly-fishing was a Belizean named Lincoln Westby. I met Westby over a decade ago on a blustery morning in March outside my motel in Hopkins, Belize. Due to a strong cold front that had blown through the day before, my transfer to his Blue Horizon Lodge had been delayed. When he asked if I was going to the lodge, I wasn’t sure if he was a guide, the owner, or merely a taxi driver. Little did I know that this unassuming man would, in less than a week, teach me more about permit fishing than I had assimilated in over 10 years of stalking this “holy grail” of fly fishing. Westby’s spry demeanor and sparkling eyes belied his six-plus decades. A Belizean by birth, he has fished the coastal waters of Belize since he was a child. 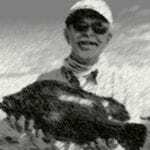 He began his fishing career as a commercial diver and fisherman before following his brothers Joel and David as guides to American spin anglers in the late 60s. Except for a stint in the British Army from 1961 to 1967, and two years working on a research ship in Bermuda, he has dedicated his life to learning the ways of the permit, tarpon and bonefish. After working as a guide and manager at nearly every lodge on the Belize coast, Westby had the passion to have his own lodge. 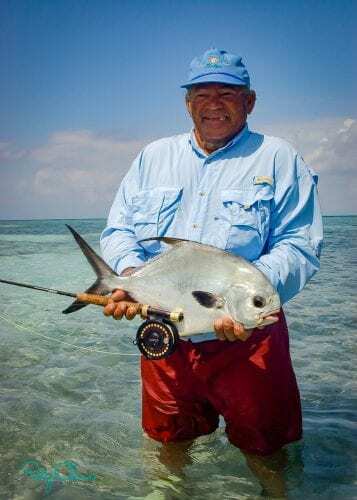 With the help and counsel of Will Bauer (now deceased), a longtime permit angler and former Belize lodge owner, the vision of the Blue Horizon Lodge was born. Westby and his common-law wife Pearline leased a small mangrove island from the government with an option to buy. The island was inundated with water on high tides and it took over six months and more than 10,000 boatloads of sawdust and sand to create enough upland to build the first building. Finally, in 1997, Bauer brought the first group of anglers to the lodge and Westby’s dream became a reality. On my trip to the Blue Horizon, I had the good fortune to pick a week when Bauer was at the Lodge, and I was able to fish with Westby on six consecutive days. Each day, I was immersed in an endless world of multi-dimensional coral patch reefs that hosted school after school of permit. And while there were few spells of more than forty-five minutes between fish, it was Westby’s intimate knowledge of the terrain and the permit that held me spellbound. I fished four and one-half days, (and spent a day observing and photographing Bauer and Westby) and landed five permit. The number of opportunities was phenomenal, and while these permit were less pressured than in other locations I’ve fished, that didn’t change their basic nature. Westby fished by the tides (high rising, high and high falling) and not by time. Keen eyes allowed him to slow motor along the edge of flats looking for fish. A mentor takes you to a new level, reminds you of the complexity of the natural world, and feeds your desire to learn. On the day I photographed Westby, he left the boat to stalk a school of feeding permit and I was able to experience a master at work. He made a high looping cast that sent the fly softly to the water’s surface just two feet short of the feeding fish. Not once, but five times, the permit rushed the fly only to turn off at the last minute. Each time Westby waited (when I would have attempted to set the hook) until the fish had just turned off the fly, and then gave a three-inch strip that teased the fish back to the fly. On the fifth look, the permit took the fly. If I had to condense the knowledge I learned in my days with Westby into a short paragraph, it would be that permit are moody, and every presentation and opportunity will be influenced by many factors. The angler must judge the mood of the fish, know where the fly is at all times, and take into account the tides, weather, availability of food, wind, the structure of the bottom, sun angle and much more. Permit fishing is incredibly demanding, and therein lies its appeal. Quantum leaps in fly fishing can be built up with years of experience, or on occasion, by having the good fortune to learn from a mentor. It keeps it fresh and vital and makes us keen for our next adventure.